There is a saying that photographs don’t lie. But, like all primary source documents, photographs should be examined carefully when used as primary sources of information. Keep in mind that photographs are created by particular people to record events from their perspective or because they want to communicate something. People who are the subjects of photographs also often have a communicative purpose in mind. 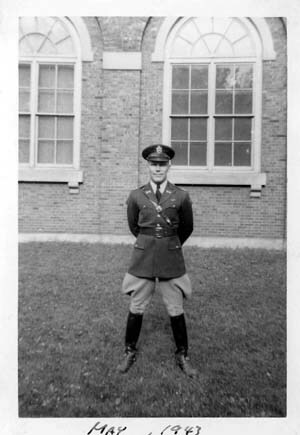 Allan Hicks, a University of Illinois student who graduated in 1943, was a member of the University of Illinois Cavalry R.O.T.C. Hicks said he joined the Calvary ROTC because it “sounded like the fun of riding horses,” but he did so during a period in which the United States was at war. For what purpose do you think this picture might have been taken?